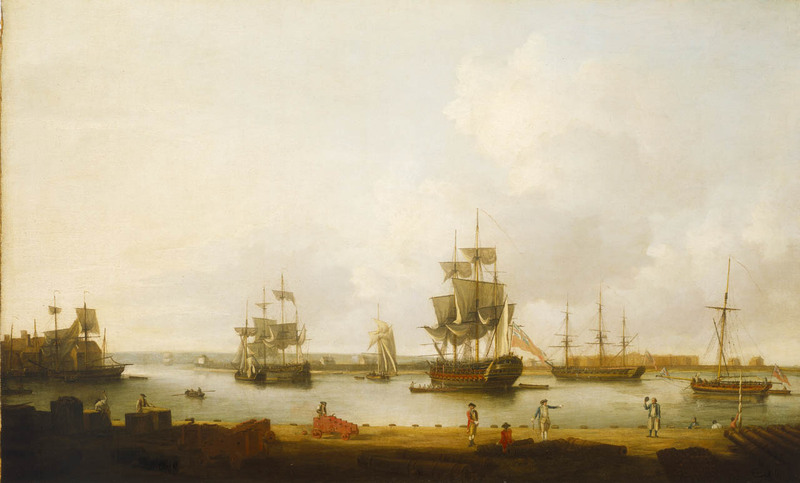 Ships off the Gun Wharf at Portsmouth, 1770, Dominic Serres, late 18th century, National Maritime Museum. Today I return to that esteemed maritime artist Dominic Serres. 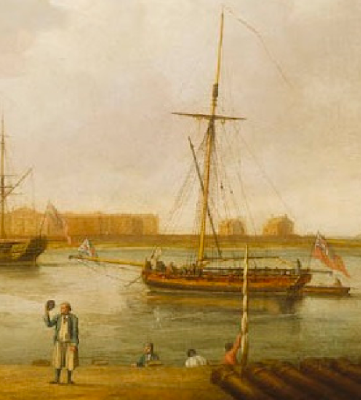 Here he portrays a number of vessels lying off Gun Wharf, an Ordnance Yard that isn't seeing much motion. Given that this is between the Seven Years/French and Indian Wars and the American Revolutionary War, it makes sense that Gun Wharf is rather quiet. Nonetheless, there are a few figures scattered about. A few work on a gun carriage and miscellaneous crates to the left. Some officers are clustered just to the right of the center foreground. The naval officer among the trio gestures to a clustered group of tars to the right. We can only see one fairly well. He lifts a cap or round hat in reply to the officer, baring his head and short hair. His blue jacket hangs open, showing his black neckcloth. The resolution is too low on this image to tell if he is without a waistcoat, or wearing a white single-breasted piece. We can say that he is wearing a pair of slops/petticoat trousers that run down to the top of his calf. Interestingly, his stockings are black or a dark blue. 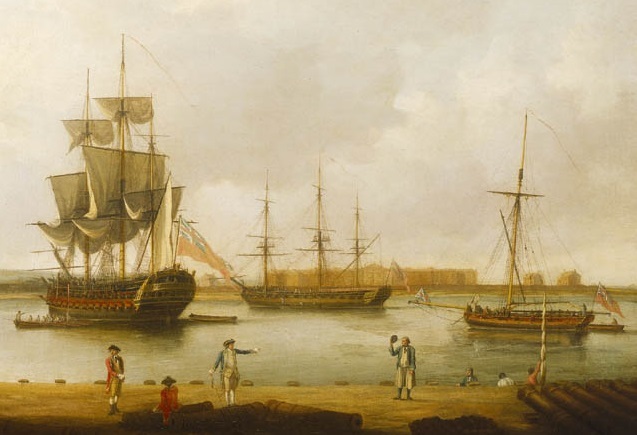 Behind the lone tar are three seamen working at a boat that is just beneath our view. Reaching up to the single mast is a man in a red jacket with a black hat: either a knit cap or a round hat. To his left is a man in his shirtsleeves with a black cap as well. Looking up toward the sailor waving his hat is a fellow in a barge cap with a silver device, blue jacket, and black neckcloth.